Don’t miss out on the greatest workout experience of your life. The Gym in Joplin is what you are looking for. We have the best workout facility in the area. Bring a friend down to our facility for the cheapest membership in town. Our staff would love to answer any questions you may have. If you would like to give us a call, call us at 417-437-9345. All of our staff on hand and ready to help start your history in the right way. Staff and managers keep the facility clean so you can enjoy yourself. We bring the boom as you walk in the door. Members enjoy how clean we keep our facility. We know you don’t like that locker room feeling, so we have provided you with private restrooms. Most of our restrooms include a private shower for you as well. Members and their guests love this. Colaw Fitness provides you with free lockers for you and your guests to enjoy. Bring your own lock from home, or purchase one from our front desk. Staff are eager and willing to help you with any questions that may arise. Drive down the best Gym in Joplin and get a membership for as low as one dollar down and five dollars a month. Our memberships include no up sales, we promise you. Every one of our members loves our facility and you will too. Our staff loves on all of our members. We even treat our guest like our members. When you become a member, you can bring a friend for free. That’s what makes us the best gym in town. Guests can enjoy all the equipment we have for free. Don’t miss out on this opportunity. The staff at the Gym in Joplin are the nicest around. As soon as you walk in the door, you will be greeted with a smile. We want to provide a positive, uplifting environment for you to enjoy your workout. Working out can be lonely by your self, so bring a friend for free every time. It does not have to be the same person. You can bring a new person every day if you would like to. That is what makes us the best gym in town. Included in your membership, you will have access to our amazing tanning beds. We offer standup beds and laydown beds for you to relax in and get a summer glow. Any tanning accessories you need, we can provide you. The front desk at our facility sells any accessories you need. Purchase any tanning lotion, tanning goggles, or single use tanning lotion from us. Make us your one stop shop for any tanning accessories. Never lose that summer glow when you can tan all year round. Staff change the bulbs frequently, so you can get the best tan. Relax after an exhausting workout in our massage area. This is included in your membership. We offer massage chairs for you to sit back and relax in. Our massage beds are members favorite things to lay back on and work out soreness after a workout. You will fall in love with our massage area. The Gym in Joplin want to provide you with the best results you want. Get lean and toned up at a gym with the highest review ratings. Achieve your weight loss goals with helpful staff along the way to guide you the right direction. If you have never worked out before, then there is no worries. We are a beginners atmosphere for everyone to work out in. Our staff level of our members. Enjoy uplifting music when you walk through our doors. The Gym in Joplin offers trainer instructions to help with your journey. Staff will teach you how to properly use our machines so you can get in the best shape of your life. Our trainer instructions schedule can be found at our front desk at the facility. You can also enjoy free nutrition instructions. Bring a friend, because they can receive all of this as well. Get in your car and drive on down on the first Monday of every month. It is our member appreciation night. If you bring in three friends on this night to sign up for a membership and refer you, you will win a free year membership. No other gym can beat that. Our Colaw Fitness 30 day in diet workout program will get you in the best shape of your life. Included in this class, we will guide you with a meal plan, workout plan, and information about protein shakes. Locate our schedule at the front desk. Staff are eager to help you achieve your weight loss goals. Lose weight fast at our facility. We are the best fitness center in town. Members love that their guests can enjoy everything that they can. Colaw Fitness at the Gym in Joplin is open and staffed 24 hours of the day and night. Our memberships will motivate you to tone up and get lean for the summer time that is upon us. Don’t forget to call our customer service department at 417-437-9345 for any questions you may have about our facility or any of our memberships. Don’t pay more than what you should. Our prices are the best in town. You can visit our website to check out more photos and information of our facility. Check out our Facebook page as well, for you will not be disappointed in what you see. Let’s get you started on being the best you, at the Gym in Joplin. The facility includes many machines for you to work every muscle in your body. 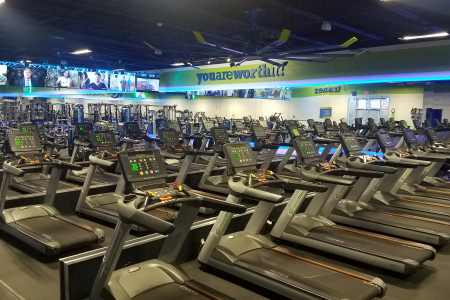 Our cardio and abs section in our facility has an abundant amount of treadmills for you. Ellipticals and bikes are also on hand for you to enjoy while you watch TV and get the best shape of your life. TVs are also in our massage area for you to watch while you relax and work out sore muscles. Let us help you get signed up today.